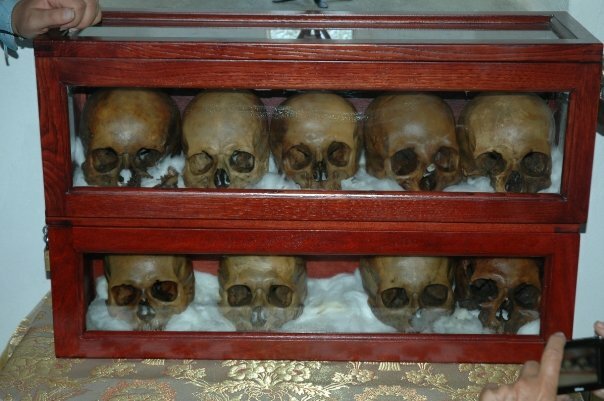 Below is an account of a wondrous miracle that happened last year on Andros on May 3, 2009 on the Sunday of the Holy Myrrhbearers, when myrrh-streaming skulls were discovered underneath the Church of the Holy Transfiguration in a crypt amidst hundreds of other relics. More can be read about this fascinating discovery in the May-June 2009 issue of The Orthodox Word which contains the article "Secret Garden of the Saints: The Holy Monastery of the Panagia Panahrantos, Andros, Greece" by Lawrence Damian Robinson (who also provided the photos). I spoke with my sister-in-law, Martha, about the event that happened at the monastery in Andros, and I'm going to try to write down as many of the details as I can while it is still fresh in my mind. She was so excited that she was speaking a mile a minute and there were so many things she told me that I hardly know where to start. But first let me just provide a bit of background about the monastery that I gathered from what she told me. 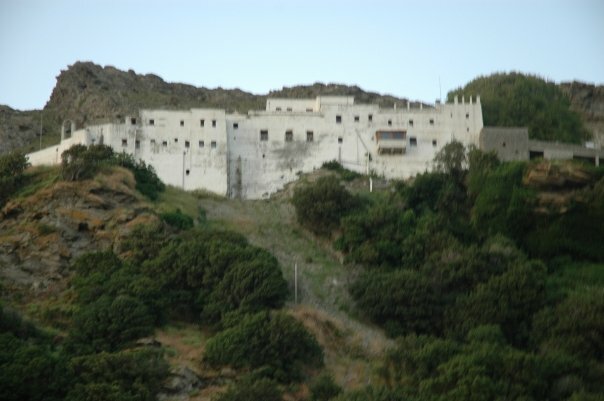 First of all, this monastery is not one of the well-known monasteries on Andros (St. Nicholas or St. Marina). This is a monastery dedicated to the Panagia “Panachrandos”, which was founded in 961 AD after the Byzantine emperor Nicephoros Fokias, who was a military commander at the time (and not yet emperor) visited the island. The circumstances of the visit and the founding of the monastery appear to have been miraculous in themselves, from the account Martha gave me. It seems that Nicephoros Fokias was sent from Constantinople to Crete to quell a rebellion there, but on the way his fleet encountered rough weather and he was forced ashore on Andros. Near the present monastery, there was a skete made up of a number of monastic cave dwellings, and when the monks heard that Nicephoros Fokias was on the island, they went to pay homage to him (as a high commander of the Byzantine empire). They told him that they had a miraculous icon of the Panagia, which was painted by St. Luke the Evangelist, and since they were living in cave -dwellings, they told him they would pray for him daily to have a speedy victory in Crete, if he would only come back and give them money to build a monastery. It is said that he agreed, and when he went to Crete, before even going ashore, he was visited by the Panagia in a dream and she told him exactly what he had to do in order to secure the peace without even having to fight; but she told him to be sure to return to Andros and build a monastery there. He listened to the vision and everything went as the Panagia told him – he quickly pacified the island without any bloodshed, and returned to Andros and donated a large sum of money for the construction of a monastery on the site where the icon had been found. Apparently the hegoumenous of the monastery at that time had prophetic sight and told Nicephoros Fokias that he would become emperor, which pleased him so much that he gave them even more money for the monastery. As a result, the monastery that was built was huge and basically like a fortress. (I have not seen it, but this is how Martha describes it, and it actually is an important detail for the rest of the account). Today, the monastery is in a terrible state of disrepair, and has only two monks: an aged hegoumenos, Geronda Eudokimos, who is around 80 and has some health problems, and a young (35-40 year old) hieromonk, Fr. Aetios (named after one of the 40 Holy Martyrs of Sebaste), who Martha said is constantly running around like crazy doing everything that needs to be done. They hardly have any money, to the point where they don't even turn on lights until after dark and even then only when absolutely necessary. They don't have a phone (not even a cell phone), and the monastery is difficult to get to by bus, so the numerous coaches that visit the other monasteries pass them by. That's unfortunate, because the monastery's church (Dormition of the Theotokos) has a wealth of holy relics. They have the kara (skull) of St. Panteleimon (which Fr. Aetios says still has hair and skin on the back of the skull, and which often produces copious amounts of fragrant myrrh during Divine Liturgies), as well as relics of St. Kyriake and the hand of St. Anastasia of Rome, the Deliverer from Potions. Martha also mentioned some other holy relics, but I can't remember which ones. Now, on to the main event. What Martha told me was that when she and her mother went to Andros for their weekend pilgrimage, they originally intended to go to one of the other more famous monasteries on the island (St. Nicholas or St. Marina), but somehow they decided to visit this monastery first. They said it's in a beautiful spot with European maples (platanos) all around, a fantastic view, and five or six springs within the monastery compound. They stopped there and had a picnic lunch, and while they were there, they decided to ask Fr. Aetios if the monastery had a guest house (just in case they couldn't find a place to stay at one of the other monasteries they were planning to visit). They had one, but Fr. Aetios had to ask the Geronda if they could stay (especially since they weren't accustomed to having visitors and the guest house was in serious disarray). But the Geronda wanted them to stay, and Fr. Aetios told them that the next day (Sunday) they were going to have the Divine Liturgy at the cemetery, not in the katholikon, and that they were going to do the washing of the monks' bones, and he seemed to be very excited about it. Martha and Effie's mother didn't really understand the significance of what Fr. Aetios was telling them, but they saw how excited they were to have them as visitors and didn't want them to feel bad, so they ended up staying and not going to the other monasteries. 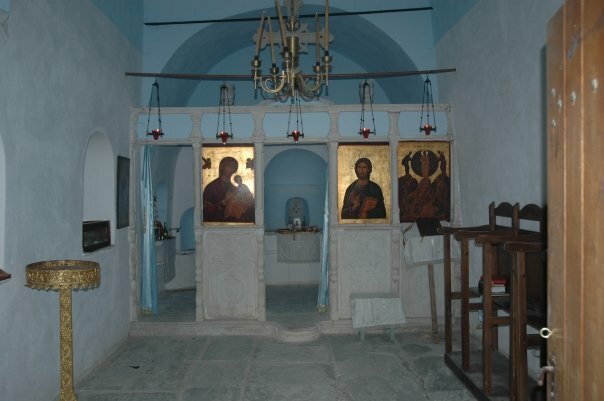 The next morning, they celebrated the Divine Liturgy in a small church outside of the monastery compound, dedicated to the Transfiguration of the Saviour (Tis Metamorphoseos, and commonly called Tou Photadoti). Let me know explain what Fr. Aetios meant by celebrating the liturgy “at the cemetery”. It seems that at some point early in its long history, the monks began burying the monks who had fallen asleep in a hidden crypt underneath this church of the Transfiguration. Martha says it was because they were afraid the Turks would desecrate the tombs and the remains, but I'm not sure I understand the timeline since the Turks did not occupy Andros as early as the 10th or 11th century; but it could have been because of pirates (which were very common and very savage during those centuries). In any case, the church is built over a crypt which Martha said is probably about 200 to 300 sq. ft. in area and about 6 or 7 ft. high. The only opening to the crypt is a hole in the floor of the church near the chanters' stand, which is covered by a stone slab about a foot thick, which blends into the floor. In other words, anyone who didn't know it was there and what it was for would mistake it as one of the paving stones of the church's floor. There is no other indication that there is a space below the church, as from the outside the walls of the crypt appear to be foundation walls. So apparently for many hundreds of years, until the liberation of Greece from the Ottoman Turks in 1821, this crypt was used as a burial place for the monastery's departed monks, whose remains were thrown down into the hole. Fr. Aetios told Martha that there are records indicating that in one year in the 1700s as many as 400 monks were buried in that year alone. They don't know how many remains are there in total, but they estimate that it is well over a thousand. None of the remains had ever been removed from the crypt, as it had never been opened up until yesterday. They proceeded to start the work of opening the outside wall to get into the crypt, and Fr. Aetios insisted that they have candles burning in the candle holder in the narthex the whole time that this work was going on. Effie's mother went back up to the monastery at a certain point, but Martha stayed on to watch them do the work and to see what was going to happen, as she was convinced they were going to see something. At a certain point, they finally got through the wall and started removing the stones, and she said the fragrance at that point became so strong that they were getting dizzy. When they finally opened up the wall to the point where they could get inside the crypt, they could only go in for a few seconds at a time because the fragrance was so overpowering. The workers were worried that there might be snakes inside the crypt, but Fr. Aetios told them that he had never seen snakes in the area and that the worst might be some scorpions. But when they finally managed to get in, they found that aside from the earth inside that had been thrown in with the monks' bones, the space was very clean (i.e. no mold or fungus or anything, and no critters of any kind). There were bones and skulls all over, all mixed together and jumbled up, and in such great quantity that the floor was not even visible; but since the strong fragrance seemed to be coming from close to where they had made the opening in the wall, they started trying to identify its source. Fr. Aetios focused on one particular skull that he seemed to think was the one (Martha said he told the workers why he thought so, but she didn't get what he was saying). They smelled it, and confirmed that it was fragrant – but at that point the fragrance didn't seem to be as strong as it had been previously. In any case, they also smelled other bones, but didn't find anything else that seemed to be exuding fragrance. They then began to bring bones out of the crypt, give them a very quick dusting to brush away loose dirt and lay them out on tables outside the church for a more careful washing later. The skull that they thought was the source of the fragrance was given the same treatment, and put on a table near the others, and they continued working. After a little while, Fr. Aetios asked Martha to go to the monastery's kitchen and make some pasta for everyone, but on the way up to go and check the candles in the church's narthex and put out those that had gotten low and light new ones. She went up to do it and as she came out of the church intending to go up to the monastery, she started screaming for the priest to come. The skull that had seemed to be fragrant was exuding myrrh from the top, which had begun flowing down its sides. Martha said that she saw the myrrh start gushing right before her eyes, and as it flowed around the skull, the skull suddenly changed appearance. Prior to exuding myrrh, it had been white like all the others, but as the myrrh flowed around it (and she said it went everywhere, all over the skull), it began to change color and become like a yellowish/amber color as she watched. Not only that, but she said that whereas the skull had been covered in places with dirt (the priest had only brushed off what was loose, the rest to be removed upon a more thorough washing), it was now absolutely clean all by itself (at that point, only Fr. Aetios, Martha and the two workers remained at the church and the rest had gone back up to the monastery, so there was no one else there who could have washed it). She also said that she felt a clear presence – as if the skull were not just an inanimate object anymore, but was a live person that she knew in front of her. Fr. Aetios and the two men ran up from where they were working and were astounded to see what Martha was seeing. They all started crying and praying, and Fr. Aetios took the holy relic in his arms and carried it into the holy of holies, whereupon it suddenly started gushing myrrh even more profusely. He placed it on a linen cloth with cotton all around it to absorb the myrrh, but as soon as they would wipe off the myrrh, more would flow so that it was hard to keep up with it. Martha called her mother on her cell phone and she came down from the monastery and saw everything as well, and confirmed to me that what Martha told me was all true. And they also brought out a piece of the cotton they had brought back with them for me to smell, and indeed, though there were no visible signs of staining on it, it was incredibly fragrant with a very sweet, flowery aroma – so much so that I not only smelled it, but I also tasted something. Martha also confirmed to me that when they smelled it in the church, they also tasted something very sweet from the fragrance. As I mentioned in my earlier e-mail, they have no idea whose relics these are (and indeed there are thousands of bones in the crypt and perhaps others of Saints yet to be revealed), but the men that were there have been praying for the Saint to reveal himself to someone in a dream or vision so that we may find out who it is. Wondrous is God in His Saints!